Just testing how to post to da blog with my phone. Brenda Boylan and I caught a sunny day out at Catherine Creek in the Columbia Gorge. Weren't many folks out yet but we still attracted a crowd. Was a nice day out but my painting wasn't much to write home about. yeah yeah one of your so so paintings is somebody else's really good painting. Looks like it was a very nice day! Were it so, Celeste. If only. 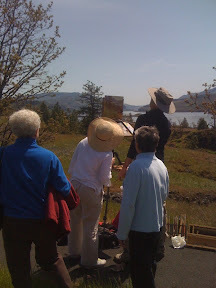 Let's just say the painting didn't live up to the subject matter, of distance hills and wildflowers. Wasn't bad enough for me to pitch a hissy-fit, but wasn't my best of the week either. Definitely a scraper. But hey, it was still a fine day to be out. Better than sitting in front of a computer. Mr T, you can blame me for the time constraint with your painting. Had I given us just 1 more hour, it may have been resolved. Oh well. Nice to see your iphone worked! Now you can post updates while on your tour! Yeah! And your first pastel was a nice one!